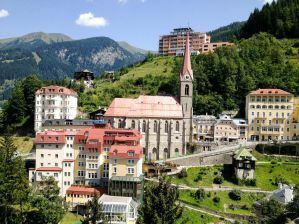 Austria is a beautiful and fun country to visit that attracts outdoor enthusiasts, music lovers, and adventurous travelers. There are a wide range of accommodation options, but if you're on a tight budget, a hostel may be your best option. How much do hostels in Austria cost? An affordable and safe hostel for backpackers, students, and budget travellers. Hostel Rothensteiner Vienna is one of the largest and most popular hostels in Vienna. It's located outside of the city center near a popular pedestrian street and Westbahnhof train station. The hostel is large, and there are a variety of amenities available for guests including a barbecue area, a nice outdoor space, a shared kitchen, and bicycles that guests can rent. The hostel also hosts a happy hour when guests can hang out and get to know each other. The hostel has six, eight, and ten bed dorms as well as single, double and three or four person private rooms. One of the best party hostels in Vienna, Austria. Vienna isn't exactly a city known of its party hostels, but if you're looking for a fun and social place to stay, then Wombats City Hostel Naschmarkt is one of the most popular. The hostel is centrally located near many of the city's top sights. There's also public transportation nearby, and a lot to see and do in the surrounding area. The hostel offers a variety of amenities for guests including free wireless internet access, free security lockers, and a free welcome drink. The staff are also helpful and knowledgeable of the city. There are a wide variety of rooms to choose from. There are dorms that sleep anywhere from three to eight people and there are also private single and double rooms if you want a little more space. The rooms are kept clean and comfortable, so this is a good place to base yourself during your time in Vienna. An affordable and safe hostel for backpackers and students in Salzburg, Austria. Yoho International Youth Hostel is one of the most popular hostels for backpackers, students, and budget travelers in Salzburg. It's conveniently located between the train station and the city center and it's just a short walk from the famous Sound of Music Steps. The hostel is well established and has been around for a long time. It offers the standard amenities for guests including a book exchange, a very basic kitchen, and wireless internet. There's also an all-you-can-eat buffet breakfast served every morning. The hostel has four, six, and eight bed dorms available as well as private double rooms. A great hostel for skiers and backpackers near Innsbruck, Austria. Doug's Mountain Getaway is a charming hostel near Innsbruck. It's located in a picturesque setting about a fifteen minute drive from town or thirty minutes by bus. It's a great place to retreat to and enjoy a peaceful and relaxing setting. They have a hot tub, sauna, and a relaxing common area where guests can hang out. You can easily pass the time relaxing by the fireplace and talking to other guests. The hostel is also located at the base of an Austrian ski resort, so there are all kinds of activities in the area. Guests can choose from a four bed dorm and private twin or double rooms. A quiet and comfortable bed and breakfast in Graz, Austria. B&B Graz is actually a bed and breakfast, not a hostel, but it is a reasonably affordable option for budget travelers. Because it's not a hostel, there are no dorms available but there are private rooms that sleep either two or four people. The bed and breakfast is centrally located and is just a five minute walk from the main station. The city center is about fifteen minutes away and there's a tram stop very close to the building. The bed and breakfast is clean and modern and it's a comfortable option for all types of travelers, whether you're traveling alone or with friends. Breakfast is served every morning in the breakfast area and the staff are available to answer any questions you might have.